Stingy Jack, perhaps also known as Jack the Smith and Jack of the Lantern, is a mythical character apparently associated with All Hallows Eve. It is common lore that the “Jack-O’ Lantern“ is derived from the character. As the story goes, several centuries ago amongst the myriad of towns and villages in Ireland , there lived a drunkard known as “Jack the Smith”. Jack was known throughout the land as a deceiver, manipulator and otherwise dreg of society. 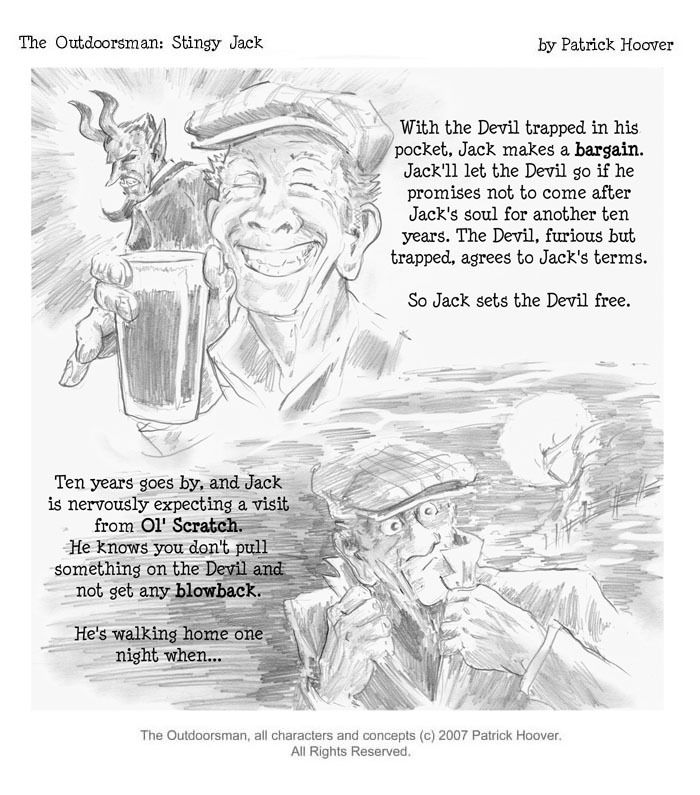 On a fateful night, the devil overheard the tale of Jack’s evil deeds and silver tongue. Unconvinced (and envious) of the rumors, the devil went to find out for himself whether or not Jack lived up to his vile reputation. Typical of Jack, he was drunk and wandering through the countryside at night when he came upon a body on his cobblestone path. The body with an eerie grimace on its face turned out to be the Devil. Jack realized somberly this was his end; the devil had finally come to collect his malevolent soul. Jack made a last request: he asked the devil to let him drink ale before he departed to hell. Finding no reason not to acquiesce the request, the devil took Jack to the local pub and supplied him with many alcoholic beverages. Upon quenching his thirst, Jack asked the devil to pay the tab on the ale, to the devil’s surprise. Jack convinced the devil to metamorphose into a silver coin with which to pay the bartender (impressed upon by Jack’s unyielding nefarious tactics). Shrewdly, Jack stuck the now transmogrified devil (coin) into his pocket, which also contained a crucifix. The crucifix’s presence prevented the devil from escaping his form. This coerced the devil to agree to Jack’s demand: in exchange for the devil’s freedom, the devil had to spare Jack’s soul for 10 years. Ten years later to the date when Jack originally struck his deal, he found himself once again in the devil’s presence. Same as the setting before, Jack happened upon the devil and seemingly accepted it was his time to go to hell for good. As the devil prepared to take him to the underworld, Jack asked if he could have one apple to feed his starving belly. Foolishly the devil once again agreed to this request. As the devil climbed up the branches of a nearby apple tree, Jack surrounded its base with crucifixes. The devil, frustrated at the fact that he been entrapped again, demanded his release. As Jack did before, he demanded that his soul never be taken by the devil into hell. The devil agreed and was set free. Eventually the drinking and unstable lifestyle took its toll on Jack; he died the way he lived. As Jack’s soul prepared to enter heaven through the gates of St. Peter he was stopped. Jack was told that because of his sinful lifestyle of deceitfulness and drinking, he was not allowed into heaven. The dreary Jack went before the Gates of Hell and begged for commission into underworld. The devil, fulfilling his obligation to Jack, could not take his soul. To warn others, he gave Jack an ember, marking him a denizen of the netherworld. From that day on until eternity’s end, Jack is doomed to roam the world between the planes of good and evil, with only an ember inside a hollowed turnip (“turnip” actually referring to a large swede) to light his way. Get your printable version of Patrick Hoover’s Stingy Jack Comic from Angry Commuter Comics published under The Outdoorsman serials. Angry Commuter Comics is a webcomic site created by artist Patrick Hoover to be a showcase for his various comic creations. The Outdoorsman is a serial comic created, written and drawn by artist Patrick Hoover. The concept is simple; it chronicles the adventures of a hunter, an outdoorsman…who hunts monsters. The Outdoorsman ventures into both strange and familiar territory to hunt the most dangerous game: creatures of the supernatural. After each successful kill, the hunter takes a trophy to mount in his trophy room of the weird and macabre! The Outdoorsman is currently presented in a short story format; bite-size stories to tantalize your mental taste-buds with pulp-flavored horror, action and dark humor. The Outdoorsman is serialized here on Angry Commuter Comics, and will soon also be available in print. Angry Commuter Comics © 2006 and The Outdoorsman © 2007 Patrick Hoover. All Rights Reserved. Official Press : “Every once and again there is a pull to return to one’s own roots or beginnings, with the perspective of time and experience, to feel the familiar things you once loved and love still,” says Loreena. In a stirring and inspirational return to her roots, Loreena McKennitt has created a new album of traditional Celtic songs, recorded this summer in a historic 1832 temple north of Toronto. The Wind that Shakes the Barley features nine songs, including such familiar classics as “Down by the Sally Gardens,” “The Star of the County Down” and “The Parting Glass.” The album also features a few lesser-known favourites, including “The Death of Queen Jane” and “As I Roved Out.” There are also two instrumental tracks, one of which was written by Loreena to commemorate Irish-Canadian history during the potato famine of the 1840s. 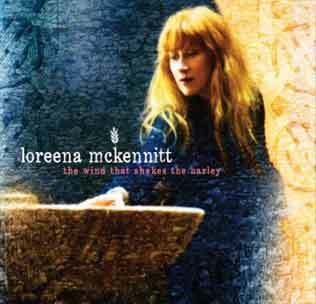 Loreena Mc Kennitt : "The Wind That Shakes The Barley" – Early Pre-sale offers of Loreena’s new album – including vinyl!! Quinlan Road is pleased to offer members of the QR Community, exclusive pre-release opportunities and special holiday bundles of Loreena’s new recording, The Wind that Shakes the Barley, due for international release next month. Available on CD, via digital download and for the first time in 16 years on high-quality vinyl in a numbered, Limited Edition run of 5,000. Be among the first to own this stirring new collection of traditional Celtic music, which includes one of Loreena’s own original compositions. Browse the special offers page of her microsite. One custom that persists in modern-day Ireland is the baking (or more often nowadays, the purchase) of a barmbrack (Irish: báirín breac), which is a light fruitcake, into which a plain ring, a coin and other charms are placed before baking. It is said that those who get a ring will find their true love in the ensuing year. On October 31 the disembodied spirits of all those who had died during the preceding year would come back in search of living bodies to possess for the next year. It was believed to be the spirits’ only hope for the afterlife. Joining this mix were evil phantoms in the form of fairies revisiting the earth and tormented the living. The fairies were often considered hostile and dangerous to humans because they were thought to be resentful of human takeover of their lands. Consequently on this night they would sometimes trick people into becoming lost in fairy mounds where they would be trapped forever. There was great apprehension for other dangers as well. Crops were in jeopardy, babies could be stolen, farm animals killed, food and milk spoiled – all because of this open doorway for evil spirits. It was a frightening time for these ancients. To protect themselves and prevent harm, the Celts would leave treats for the spirits outside their homes. The idea was that a spirit looking for a person to possess would be sidetracked by a bowl of fruit, nuts, and other treats. The spirit would then leave in peace. Spirits were believed to assume grotesque appearances this night. To avoid being recognized by them people would wear masks when they left their homes after dark so that the ghosts would mistake them for fellow spirits and not plague them. The trick-or-treat custom reflects this superstition. Dressing in costume for Halloween has both European and Celtic roots. Hundreds of years ago, the winters, with it’s long dark days were frightening. It was always uncertain wheather food supplies would last through the long winter. On Halloween, when it was believed that ghosts walked the earth, people thought that they would encounter ghosts if they left their homes. To avoid being recognized by wandering ghosts, people wore masks when they left their homes after dark so the ghosts would mistake them for fellow spirits. Also, to keep spirits away from their houses, people placed bowls of food outside their doors to appease the ghosts and prevent them from attempting to enter. Fire symbolized the power of the sun deity while it was believed that it offered protection against mischievous ghosts. Home fires were allowed to go out and be rekindled with protective sacred fires at the end of this, the pagan year. Some believed spirits could be warded off by carving a grotesque face into a gourd or root vegetable like a turnip and placing a candle inside. Because ghosts and witches feared fire, the candle within the jack-o-lantern along with the scary face became a weapon against evil influences when placed in front of the home. It was believed that witches used skulls on Halloween to communicate better with the dead. It was also believed that witches derived from black cats their power to invoke evil spirits. The Celts were particularly fearful of black cats because they thought the animals were originally humans who had been transformed by sinister powers. Since this night belonged neither to one year nor the other, Celtic peoples thought that chaos reigned, and so the masses would engage in horseplay and practical jokes. Hence we see some of the original “trick” in trick-or-treating. The tradition of “trick-or-treating” lies in the English traditions of early All Souls’ Day parades. During the festivities, the poor would beg for food, and be given pastries called “soul cakes” in return for their promise to pray for a family’s dead relatives. The distribution of soul cakes was encouraged by the church as a way to replace the ancient practice of leaving food and wine for roaming spirits. The practice was referred to as “going a-souling” and was eventually taken up by children who would visit the houses in their neighborhood and be given ale, food, and money. 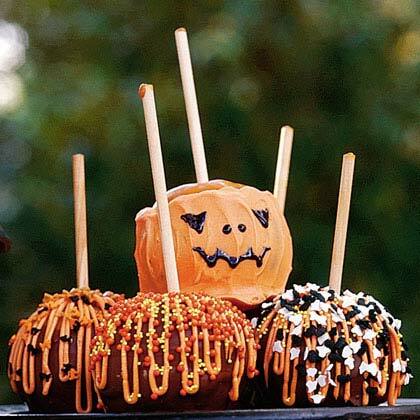 Sometimes Halloween was called “Nutcrack Night” or “Snap Apple Night” because families gathered together before the fire to tell stories about their departed relatives, and eat nuts and apples. Ducking or bobbing for apples was a marriage divination. The first person to bite an apple would be the first to marry in the coming year. Apple peeling was a tool to predict how long your life would be. The longer you could make the apple peel come off unbroken, the longer your life was destined to be. Why apples? In the course of the four hundred years that the Romans ruled Celtic lands, two festivals of Roman origin were combined with the traditional Celtic celebration of Samhain. The first was Feralia, a day in late October when the Romans traditionally commemorated the passing of the dead. The second was a day to honor Pomona, the Roman goddess of fruit and trees and whose symbol was the apple. Halloween’s "trick-or-treating" tradition: Is it British or American? In the late 1800s, there was a move in America to mold Halloween into a holiday more about community and neighborly get-togethers. At the turn of the century, Halloween parties for both children and adults became the favorite way to celebrate. Parents were encouraged by newspapers and community leaders to take anything “frightening” or “grotesque” out of Halloween celebrations. Because of their efforts, Halloween lost most of its superstitious and religious overtones by the beginning of the twentieth century. Parties focused on games, such as Pin The Tail On The Donkey, Blind Man’s Bluff, Bobbing for Apples, foods of the season, and festive costumes. Of course, there were always scavenger hunts where boys and girls could pair up and search in the dark. And of course, fortune telling, and games to divine your “true love” were popular. The tradition of “trick-or-treating” lies in the English traditions of early All Souls’ Day parades. During the festivities, the poor would beg for food, and be given pastries called “soul cakes” in return for their promise to pray for a family’s dead relatives. The distribution of soul cakes was encouraged by the church as a way to replace the ancient practice of leaving food and wine for roaming spirits. The practice was referred to as “going a-souling” and was eventually taken up by children who would visit the houses in their neighborhood and be given ale, food, and money. Sometimes Halloween was called “Nutcrack Night” or “Snap Apple Night” because families gathered together before the fire to tell stories about their departed relatives, and eat nuts and apples. Although assumed to be an American tradition, the history of the trick or treat Halloween activity probably originated in Europe with the tradition of guising. 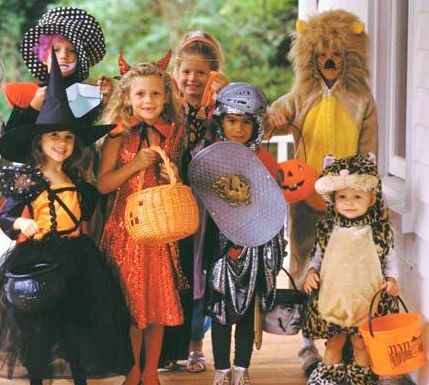 American immigrants from Ireland and Scotland took with them their traditional activity of ‘guising’ on Halloween and it is felt that this gradually evolved into the American kids activity of trick or treat. The apparently harmless lightened pumpkin face or “jack-o’-lantern” actually is an old Irish symbol of damned soul. A man named Jack was supposed to be able unable to enter heaven due to his miserliness, and unable to enter hell because he had played practical jokes on the devil. As a result, he was condemned to wander over the earth with his lantern until judgment day (i.e., the end of the world). 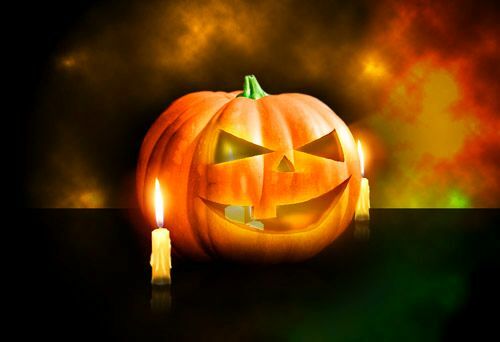 The Irish were so afraid that they would receive an identical plight that they began to hollow out pumpkins and place lighted candles inside to scare away evil spirits from their home. Guisers would wear grotesque masks or blackened faces and costumes and go from door to door performing songs, dances or small dramatic pieces for which they would receive treats, such as money, sweets, nuts or alcohol. Halloween was also a traditional night for mischief and tricks to be played in Britain. In Britain, turnip masks were worn and lanterns and lights were also a strong Halloween tradition, with householders burning candles and lamps all night in an attempt to ward off evil spirits. On October 31 the disembodied spirits of all those who had died during the preceding year would come back in search of living bodies to possess for the next year. It was believed to be the spirits’ only hope for the afterlife. Joining this mix were evil phantoms in the form of fairies revisiting the earth and tormented the living. The fairies were often considered hostile and dangerous to humans because they were thought to be resentful of human takeover of their lands. Consequently on this night they would sometimes trick people into becoming lost in fairy mounds where they would be trapped forever. There was great apprehension for other dangers as well. Crops were in jeopardy, babies could be stolen, farm animals killed, food and milk spoiled – all because of this open doorway for evil spirits. It was a frightening time for these ancients. To protect themselves and prevent harm, the Celts would leave treats for the spirits outside their homes. The idea was that a spirit looking for a person to possess would be sidetracked by a bowl of fruit, nuts, and other treats. The spirit would then leave in peace. Spirits were believed to assume grotesque appearances this night. To avoid being recognized by them people would wear masks when they left their homes after dark so that the ghosts would mistake them for fellow spirits and not plague them. The trick-or-treat custom reflects this superstition.